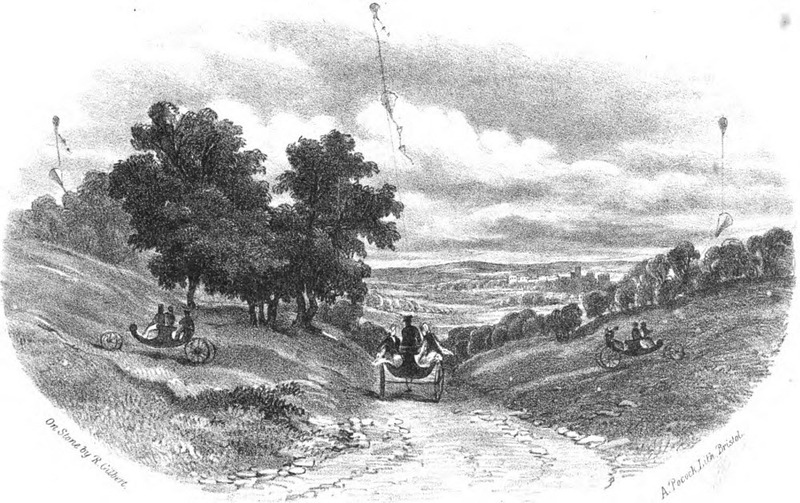 On 8 January 1822, an extraordinary journey was made from Bristol to Marlborough. 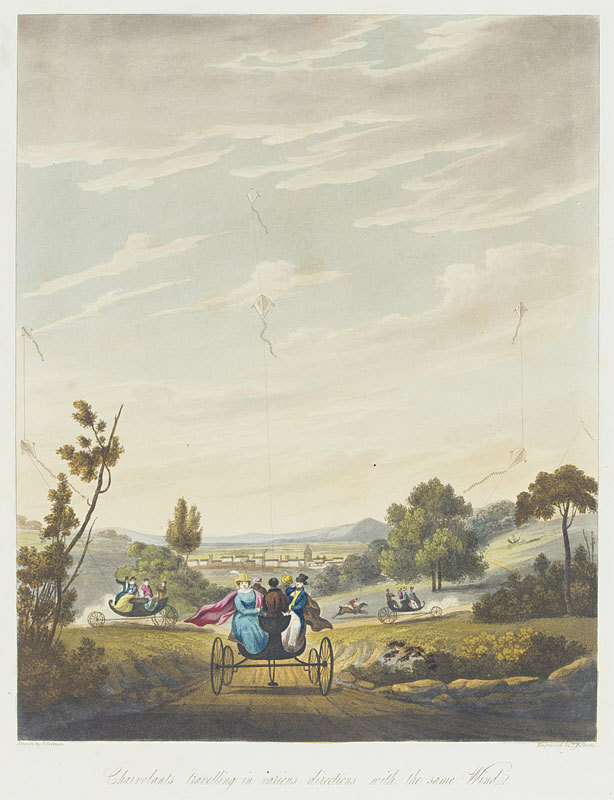 An English schoolteacher named George Pocock took his wife and his kids on a 182 km-trip in a carriage drawn not by horses but by a couple of enormous kites. Pocock designed the carriage himself, which he called “Charvolant”. George Pocock was fascinated with kites from a young age, and as he played and experimented with them, he learned that kites had tremendous lifting power. Young Pocock would tie small stones at the end of the string attached to the kite and watch it soar into the skies. As Pocock grew older, his experiments became bolder and more dangerous, usually involving his own children. In one stunt he put his young daughter in a wicker chair, hoisted her up in to the air with a 30-foot-tall kite and then flew her across the Avon Gorge. Fortunately she survived and went on to become the mother of the cricket legend W. G. Grace. Later the same year—year 1824—he flew his son to the top of a 200-foot-tall cliff outside Bristol. Two years later, he patented the design of his “Charvolant” buggy. 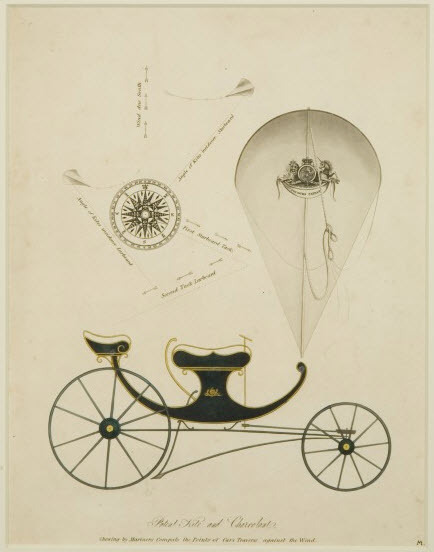 The Charvolant consisted of two kites on a single line that was 1,500 to 1,800 feet long (nearly half a kilometer) and was capable of pulling a carriage with several passengers at a fairly fast speed. Steering was achieved by four control lines attached to the kite, and a T-shaped bar that controlled the direction of the front wheels. Braking was provided by an iron bar that could be pushed down into the road. Shortly after its invention and after many risky trials, Pocock published a book titled The Aeropleustic Art or Navigation in the Air by the use of Kites, or Buoyant Sails, where he sang the virtues of travelling in a Charvolant. Pocock mentions that during his trials he timed the Charvolant travelling at 20 miles an hour (32 km/h) over considerable distances, and a mile could frequently be covered even over heavy roads in 2 minutes and three-quarters. Because the weight of the vehicle is partially supported by the kite, the buggy glides over any potholes making the journey considerably less bumpy. “The occasional dips and irregularities in the surface of the road are scarcely perceptible,” he wrote. Pocock tried hard to interest the public in his invention, mentioning that the Charvolant could pass free at turnpike toll gates because tolls were levied according to the number of horses the carriages were pulled by, and the Charvolant had none. Pocock also advocated numerous other uses for kites, such as as auxiliary sail power for ships, as means of dropping anchor and effecting rescues from shipwrecks. Despite his attempts, the Charvolant failed to ignite the interest of the public, possibly because controlling the buggy was not easy. Nevertheless, Pocock and his family continued to use the Charvolant for day trips until his death in 1843.